This Giveaway is now closed - Thank You to everyone who entered! Giveaway Day is here! This is my first time participating in this event coordinated by Sew, Mama, Sew! If you're new my blog, I hope you'll browse through my posts and visit again. I try to post regularly about whatever I'm working on, whether its sewing, machine embroidery or other crafting and home dec projects. I'm slightly addicted to these in-the-hoop machine embroidery designs from Embroidery Garden! I recently purchased the new Zipper Cases Set, and these are 3 of my 'sample' stitch-outs for the Credit/Business Card Case, iPhone Case and Tissue Case. The really nifty detail about this set is that when the embroidery is done, the inside lining is neatly finished with no seams or raw edges exposed, other than a few hand stitches. All three of my samples are made using the same fabrics - the covers are brown batik with light teal blue flowers and vines, and the linings are marbled teal blue. The front of each case is quilted and the backs are padded. They all turned out great! The iPhone Case is about 5.5 inches wide by 3.375 inches tall - I don't have an iPhone, but my Blackberry fits nicely with room to spare. My digital camera also fits in this size case. I made a matching removable strap so it can be carried as a wristlet. The wrist strap can be used to attach the case to a handbag or tote by attaching the folded fabric end to the split ring, wrapping it around a handle and clipping the swivel clasp to the ring. The Tissue Case is 5.5 inches long and 3.25 inches wide and can hold a package of pocket tissues. It zips up the center to keep the tissues nice and neat. I don't remember where I bought the brown batik fabric and I wish I could get more of it! I only have a remnant left, so this set will be one-of-a-kind or few-of-a-kind if I cut very carefully! This giveaway is limited to US residents or individuals with a US mailing address only. For a chance to win this zipper case set, all you need to do is leave a comment on this blog post by 8pm EDT on Friday, May 25. 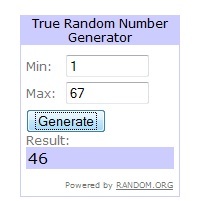 Only one entry is needed; if you leave multiple comments, only the first one will count as your entry. You can comment about the zipper case set or, since next weekend marks the unofficial start of Summer, you can share something you're looking forward to doing this summer. Please be sure you include a way to reach you by email in your comment. An email address or blog link is fine - don't post your mailing address. I’ll use www.random.org to choose the winner and will contact them by email. The winner will have 3 days to respond before I contact a new winner. The winner's name will be announced here on this blog post by May 27, 2012. Don't forget to go back to SMS to enter more Giveaways! Comment #46, atabanana29! Congratulations! Please watch your inbox for an email from me.